In July 2017, the All-Party Parliamentary Group on Arts, Health and Wellbeing (APPGAHW) published a report outlining the case for the role of arts in health and well-being entitled, Creative Health: The Arts for Health and Wellbeing. Commissioned to improve awareness of the benefits that the arts can bring, this two year inquiry captures evidence, conversation and practice with patients, arts and cultural organisations, academics, health care professionals and policy makers, making, possibly the strongest case yet, that arts have a significant and positive impact on health and well-being. 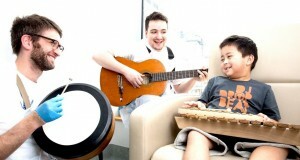 What is particularly interesting to see is evidence captured around the impact that early arts intervention can have on well-being of children in early childhood and the whole family; and reference to the variety of ways in which music plays a role in healthcare settings for children and young people of all ages. To draw out these themes in more detail, Sound Connections commissioned Sally-Anne Donaldson from Creative Homes, one of the organisations cited, and David McKenny from Pulse Arts, to reflect and respond to the report.